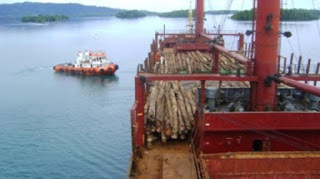 The Solomon Islands Government through the Ministry of Forestry and Research (MFR) has halted a log shipment attempted by the Asia Pacific Investment Development (APID) this week. A notice was issued against the company to stop any export of round logs and to immediately halt any logging operations on Rennell Island. Permanent Secretary, Vaeno Vigulu said this action was taken following claims the mining company had felled and exported round logs ‘illegally’ without the right process which had angered landowners in Rennell. Vigulu said the shipment is currently held up at Noro Port by customs officials and the matter is now pending a High Court ruling. “We have applied for a seizure notice which means the logs are now state properties and as a responsible ministry we’ve played our part,” he said. Vigulu also clarified that they have not issued any felling licence or export permit for APID to pursue logging activities on Rennell. “The action by APID was not right, thus the Forestry Acts empowers the Ministry to issue a seizure notice to halt the operation,” he added. The seizure notice was served to the company but APID continued to ignore and attempted logs out of the country. He also warned that his Ministry will investigate further to determine if any Forestry Officials are involved in the matter. APID is a mining company which has its license to mine bauxite on Rennell revoked by the Minister of Mines following controversies surrounding its operation. A legal challenge between the company and the Minister of Mines is currently before the High Court. update us the landowners in Rennell upfront of this robbery mining by all chinese operating companies in Rennell, how much tonnage they shipped and the amount of money from sales of tonnage and what market they sold to in china and others. all the seized logs plus another 25000cubic seized logs were proven in court up to the Court of Appeal of SI that they were legally my properties but have not recieve any payment as yet is amazing and proves how corrupt we are treated and the political scale of interference from inside the system that needs more to be done on. my expression as the casaulty of this piece of outdated items.